The Seahawks will clinch a playoff berth — their seventh in nine seasons under coach Pete Carroll — with a win against the 49ers on Sunday. Beat writer Bob Condotta breaks down what Seattle has to do and makes his pick. The Seahawks need only to beat the 49ers on Sunday in Santa Clara to get a playoff berth. Can they get it? Here’s a look at our weekly keys to the game as the Seahawks and 49ers kick off at 1:05 p.m. on Fox. Seattle back seven vs. 49ers TE George Kittle. 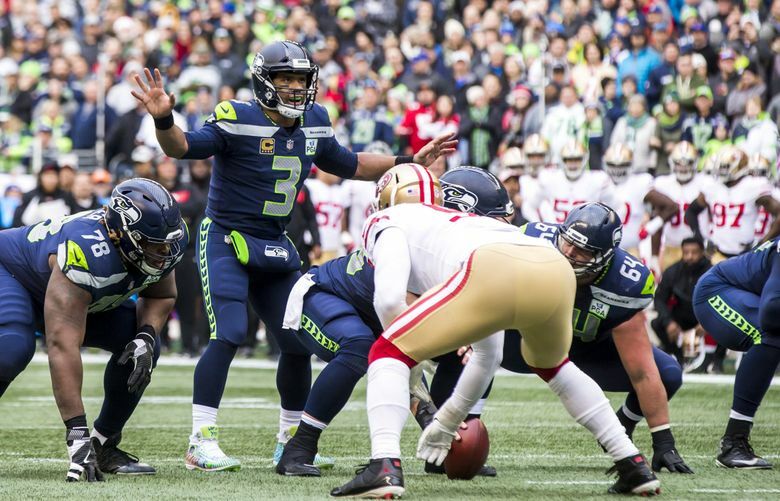 The Seahawks gave up a season-high 414 passing yards against the 49ers on Dec. 2 and doing a better job in that area looms as the biggest thing Seattle has to do this time around. Former Husky star Dante Pettis led the way for the 49ers that day with 129 yards and two touchdowns. But he’s listed as questionable for Sunday with a foot injury. Regardless, Kittle — a second-year player out of Iowa taken in the fifth round who was reportedly also a target of the Seahawks — projects as Seattle’s main reason to worry. He’s coming off one of the best games in NFL history for a tight end with 210 yards in last Sunday’s upset of Denver — third most by a tight end since 1960 — and has 1,103 receiving yards for the season, 10th most in the NFL entering the weekend. He’s especially dangerous after the catch with 708 yards, second-most of any NFL receiver or tight end. Pass defense is always a group effort, but the responsibility for a tight end will largely fall to linebackers Bobby Wagner and Austin Calitro, safety Bradley McDougald and nickel back Justin Coleman. Calitro said this week the key is to not get caught up in some of the 49ers’ backfield deception and lose track of where Kittle is. First-round pick Rashaad Penny won’t play due to a knee injury, which elevates Davis into a larger role in the backfield rotation behind Chris Carson. Carson shouldered most of the load last Monday with 90 yards on 22 carries, and the short week might mean the Seahawks will want to pass off a little more of that work to Davis with Penny sidelined. Figure Davis to be more than happy to accept that request — he was a fourth-round draft pick of the 49ers in 2015 and played 14 games for them before being waived in 2017 and claimed by the Seahawks. Much has changed with the 49ers since then but Davis — who is averaging a career-high 4.5 yards per carry and already has a career-high 24 receptions — might still want to show anyone who remains what they are missing. There’s no question the Seahawks sorely missed Baldwin last Monday night against the Vikings when Russell Wilson was held to a career-low 72 yards and Seattle held to just 60 net passing yards — the fourth fewest in team history in a game the Seahawks won. Seattle’s passing game was also largely lacking in games Baldwin missed earlier this year against the Bears (net 202) and Dallas (net 182). Baldwin is listed as questionable with a hip injury that held him out against Minnesota but said Friday he will play. Even at less than 100 percent Baldwin is a threat opponents have to worry about and potentially opens up things for other receivers — and you know he’d like to get another pass or two on good friend Richard Sherman. The loss of Penny also elevates McKissic in the running back depth chart. McKissic was activated to the 53-man roster two weeks ago but has only played three offensive snaps in two games (he has been a regular on many special teams with 28 snaps there). Without Penny, McKissic is the third tailback, and with Davis serving as the backup may serve the two-minute/third-down role that Davis usually does, giving McKissic a chance at being a part of some critical situations. That’s the passing yards for 49ers QB Nick Mullens the last two weeks, the most of any QB in the NFL. Seattle allowed 414 of those on Dec. 2, but Mullens also threw for 332 against the Broncos in a surprising 20-14 win over Denver last Sunday (210 to Kittle). The Broncos are no great shakes against the pass, ranking 26th at 264 yards per game (Seattle is 17th this week at 246). But those stats show the ability of Mullens and the 49ers to take at least some advantage of weaknesses when they are there. The Seahawks did not tackle well in the secondary in the first game by their own admission. “It’s huge,’’ Seattle safety Bradley McDougald said this week of the importance of tackling. “Small leaks of yardage like that, missing tackles in the flat, those yards after contact – those are game-changing plays in itself.’’ Expect the Seattle secondary to have heard a lot about what happened the first game — that seemed apparent in the way the Seahawks played against the Vikings in holding Minnesota to a net of 199 passing yards — fourth fewest allowed by Seattle this year. Seattle has won nine in a row against the 49ers in the regular season (10 in a row including playoffs) and just walloped San Francisco at CenturyLink Field two weeks ago, 43-16. But the wins in Santa Clara during the streak haven’t all come easily and this one figures to be more of a slugfest than the first meeting. Still, needing only a win to clinch a playoff berth should be enough for the Seahawks to get the job done.